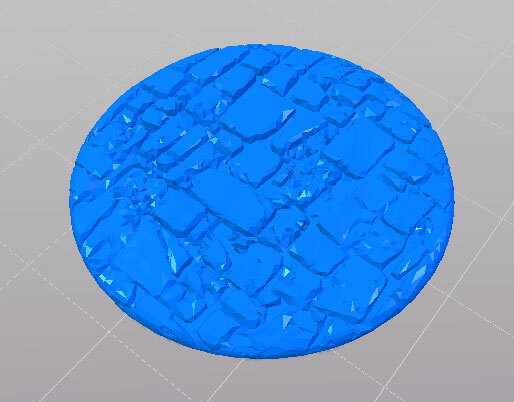 I designed some round bases, intended to be combined in a slicer with a baseless figure to be printed as one, though of course they could also be printed separately and be glued together. The links in the image captions will take you to the Thingiverse page where the files are located. So far, the diameters available are 25mm, 36mm, 40mm and 50mm. They're available either with a simple generic undulating texture, as shown to the left, or with a rough paving texture, like that on the right. The average thickness is about 2mm, I guess. I neither know, nor much care, what the official critter-size bases are in D&D 3 to 5, but if that actually matters to you it should be a simple exercise to resize one of the existing bases to the exact size you need. Note that in Cura, if you're combining a base with a figure model, you will have to go into the program preferences and turn off "Automatically drop model to baseplate", or else any figure you put on top of the base will be buried up to its ankles. Be sure to zoom right in and make sure that the soles of the model's feet (or pseudopods or whatever) overlap with the surface of the base so that they do actually print as one piece.